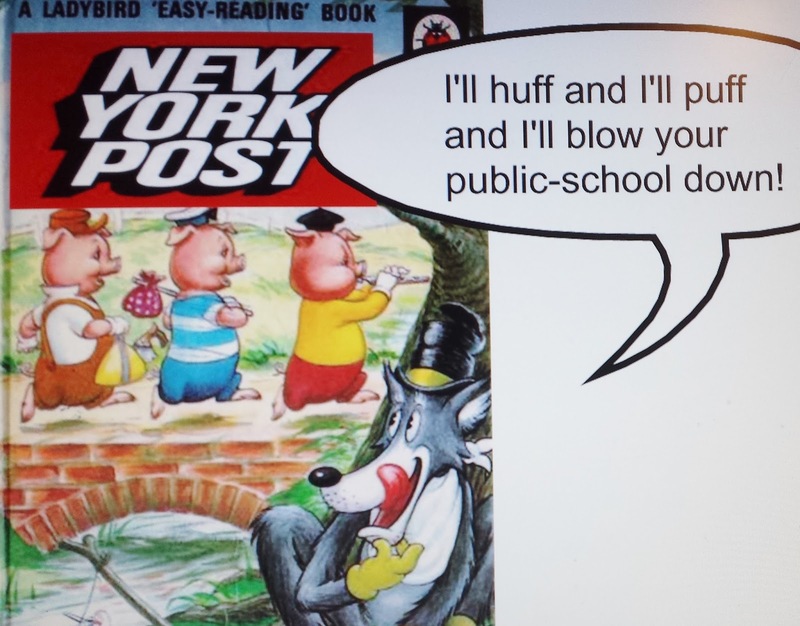 NYC Educator: The Post Huffs and Puffs...Some More! The NY Post recently featured an article entitled, "The city thinks 'The Three Little Pigs' is a book for high schoolers." The staff probably hopes that such an article will make the public cry out in utter disgust and run off to the nearest charter school. Imagine eleventh graders using kindergarten texts! Isn't the moral of the story: "Look how public funds are wasted!"? And shouldn't the headline properly read, "Stupid public-school teachers rob children of their education! Governor Cuomo and his wealthy backers were right!" It is only towards the bottom of the story that the article mentions The Three Little Pigs was used as a five-minute "Do Now" to discuss point of view and bias in college-level texts used by the class. So, do I know the truth? No. Do I believe the initial shock and horror generated by this story would be sustained by further investigation? I highly doubt it. Do I think The Post knows the truth. I highly doubt it. Do I suspect smear merchants are at work? What do you think? The Post might feature me, center stage, next, as well as some of my colleagues. I once used different versions of Cinderella with ninth-grade students to discuss the difference between transcendent values, or ideas, developed independently across cultures and cultural diffusion. We looked at fairy tales from Persia as well as China which seemed startlingly similar to Cinderella. (By the way, if you're a hard-working City teacher, and your name is Cinderella, The Post may look a lot like a stepsister to you. I don't advise waiting for a fairy godmother though!) I believe honesty and truth are transcendent values. I'm guessing The Post falls short here. Sensationalism triumphs, given its agenda against public schools and its desire to sell more papers. There is another point which the article misses entirely--although I do not sense that it is relevant to the specific situation described. Some high-school students, through no fault of their teachers past or present, may not be able to read even The Three Little Pigs. Many kids arrive as immigrants, speaking no English. They arrive at any point during the year. Public schools keep their doors open. Too many charters shut them. The City schools will be flooded with more of these kids in the future. Many are poor and unschooled in their own countries. They flee to us for a better life. The very people who try to help them, their teachers, are blamed for their lack of English and low grades. Teachers are the easiest ones to blame. Since part of what they try to do is teach people to play fair, they probably won't even know what hit them! I wish Yaov Gonen and Bruce Golding, the two little authors of the piece on The Three Little Pigs would do a better job of figuring out what counts as news and what counts as another phony excuse to attack teachers. Why don't they go undercover and teach some of the impoverished children in our City schools? Let them write a few articles then, perhaps, piece together a book. And if they really care about the students, let them stay on to make teaching their mission in life--instead of making it a mission to scapegoat teachers. Yes, let shamed teachers now scrap the use of The Three Little Pigs as a jumping off point to discuss point of view and bias. Let teachers use The Post instead. Students should know that the news they read is full of biases. And, one of the most common biases today, given the agenda of the financial backers, is a concerted campaign against civil servants, many of whom sacrificed higher pay and prestige, but not personal integrity, to make teaching their mission in life.